Pakistan 5-322 (Mohammad Hafeez 122, Sohaib Maqsood 73, Sharjeel Khan 61, Suranga Lakmal 2-73) beat Sri Lanka 311 (Kusal Perera 64, Dinesh Chandimal 46, Junaid Khan 3-44) by 11 runs. Pakistan hammered 322 for the loss of five wickets in 50 overs and the Lankan Lions were bowled out for 311 with two balls still in hand. Mohammad Hafeez (Pakistan) was declared ‘Player of the match’ for his brilliant century. The first One Day International of the five match series was played on Wednesday, December 18, 2013, at Sharjah Cricket Stadium. Earlier, Misbah-ul-Haq won the toss for Pakistan, opted to bat first and lost the first wicket at 35. 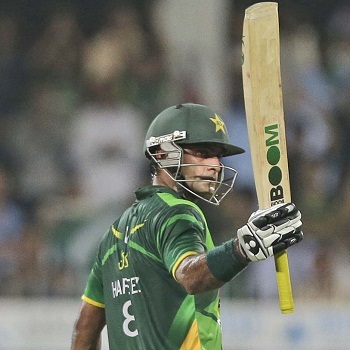 Mohammad Hafeez got together with the debutant, Sharjeel Khan, who was striking the ball nicely. 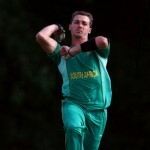 The first opened his innings with a couple of fours whereas the latter attained his maiden ODI fifty with a four. Sharjeel Khan was dropped at 57 but was gone at 118 for 61 and was replaced by Sohaib Maqsood. Mohammad Hafeez reached his fifty and the duo speeded up the run rate with regular boundaries. Sohaib Maqsood achieved his third ODI half century in the 41st over while Mohammad Hafeez blasted his sixth ODI hundred with a grand six. The partnership was dismantled at 258 when Sohaib Masood was gone for 73. Shahid Afridi contributed 34 quick fired runs and Mohammad Hafeeez smashed 122 as the Green Shirts amassed 322 with five wickets remaining. Suranga Lakmal was the main wicket taker with two whereas Thisara Perera and Seekkuge Prasanna claimed one wicket each. Kusal Perera along with Tillakaratne Dilshan provided a brisk start for the Islanders by scoring 66 in 12.5 overs. The latter was caught smartly by Mohammad Hafeez off Junaid Khan for 30 and was replaced by Kumar Sangakkara. Perera rushed to his second ODI fifty in the 15th over whereas Sangakkara surrendered for 23. Kusal Perera was declared leg before wicket off Mohammad Hafeez for 64 when Dinesh Chandimal and Angelo Mathews associated in the center. The pair punished the rival bowlers in the power play overs and enhanced the score to 214 when Chandimal ran himself out for 46. Mathews became the next victim two runs later for 31 as Seekkuge Prasanna and Sachithra Senanayake joined in together. The visitors required 96 runs from the last 48 balls when the batsmen took over and started punishing the rival bowlers. The boundaries were flowing from their willows and 87 runs were assembled in 45 mere balls. Senanayake was the 8th batsman who went back to the pavilion for 42 and Prasanna was the last batsman to be dismissed for 42 as the Islanders managed 311 in 49.4 overs. Junaid Khan was the most successful bowler with three wickets, Shahid Afridi got two whereas Mohammad Hafeez, Sohail Tanvir and Bilawal Bhatti shared one wicket each. Pakistan triumphed in the tense opening encounter with a little margin of 11 runs and leads the series at 1-0.